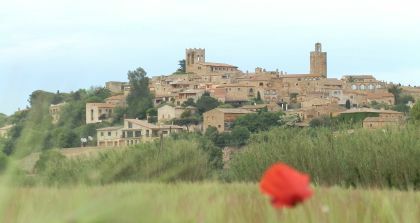 This is a short walk around the back of Pals across the fields to the neighbouring village of Sant Feliu de Boada that gives great views of the historic centre of Pals. Sant Feliu itself is a tiny village but packed full of restaurants which seem to be extremely busy at weekends and festivals.The walk can easily be extended to Sant Julia de Boada and Fontclara, but for reasons of time we needed to keep the walk short. 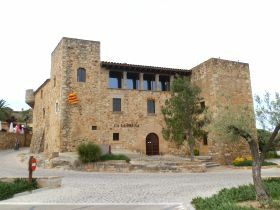 Pals itself has a historic old part that rises up on the hill with a tower and church at the top. It stands among levels that was once marsh or lake, but that is now used for growing rice and other crops. As a result it has a commanding position over the land around and is very prominent from all directions. The centre itself is in two parts. The first part you come to is the untouristy modern area with an array of local shops and restaurants. 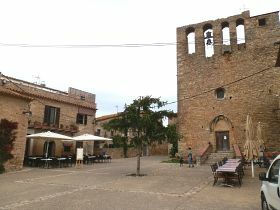 The historic centre sits a little way back from here and you have to get out of the car and walk. The starting point for the walk is in the car park underneath the older part of Pals. As we're not trying to visit the village directly we stay by the lower walls of the old town and find the track that leads out into the countryside past horta (cottage gardens or allotments) and out into the fields. 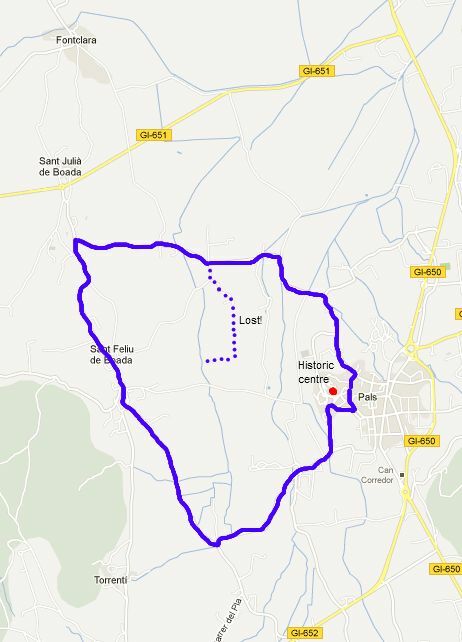 The starting route is a bike route and the track extends out to Torrent and off to Palafrugell. The walk is level and we cross a bridge over a stream full of yellow iris. After around 1km the path splits and we take the right hand path to Sant Feliu de Boada. To the right as we walk, there are excellent unspoilt views of Pals above the trees and meadows. Sant Feliu de Boada is small, but very well maintained with many traditional-style houses that look as if they have just been restored with rich full gardens. Following the main street we reach the heart of the village - a small nucleus of 3-4 streets around the church. Around the church and in the streets beyond though are several well-to-do looking restaurants. We know from experience from summer bike tours that Sant Feliu gets packed with cars at weekends with people coming to eat. We continue out towards Sant Julia de Boada on the road. Ahead of us shepherds and their dogs are driving a large flock of sheep from one field up towards the farm for the evening, the dogs doing excellent work of keeping the sheep together. Sheep are common in many areas, though because the fields are unfenced the flocks are always watched by shepherds and dogs and then moved back into farms or enclosures for the night. The road has a right turn back towards Pals. We could continue up to Sant Julia de Boada and Fontclara, but we're pushed for time. As we come down past the pig farm we think we can take a short cut off the road across a track to get to the back of Pals village. Wrong! We walk across the fields past an isolated farm house and then realise the path we're on has turned back towards Sant Feliu. Now we're going to be late. So we double back rather than try any other routes or paths and follow the road back into Pals. No time to photograph the centre so still no photos of the heart of Pals for the blog.